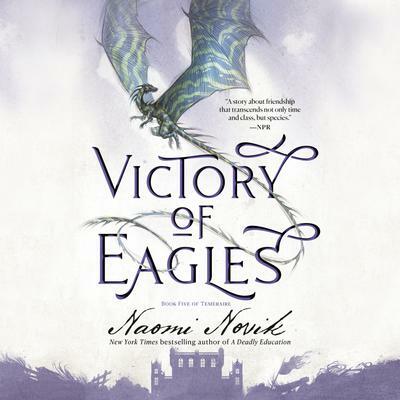 Naomi Novik’s triumphant debut, His Majesty’s Dragon, introduced a dynamic new pair of heroes to the annals of fantasy fiction: the noble fighting dragon Temeraire and his master and commander, Capt. Will Laurence. Now in the latest novel, they soar to new heights of breathtaking action and brilliant imagination. It is a grim time for the dragon Temeraire. On the heels of his mission to Africa, seeking the cure for a deadly contagion, he has been removed from military service–and his captain, Will Laurence, has been condemned to death for treason. For Britain, conditions are grimmer still: Napoleon’s resurgent forces have breached the Channel and successfully invaded English soil. Napoleon’s prime objective: the occupation of London. Separated by their own government and threatened at every turn by Napoleon’s forces, Laurence and Temeraire must struggle to find each other amid the turmoil of war and to aid the resistance against the invasion before Napoleon’s foothold on England’s shores can become a stranglehold. If only they can be reunited, master and dragon might rally Britain’s scattered forces and take the fight to the enemy as never before–for king and country, and for their own liberty. But can the French aggressors be well and truly routed, or will a treacherous alliance deliver Britain into the hands of her would- be conquerors?